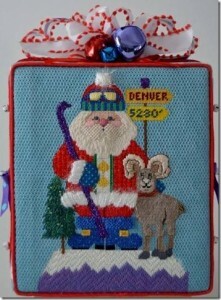 Our June project for Denver needlepoint stitchers is the Mile High Santa designed by Libby Sturdy! He is ready for individual interpretation, as the stitch guide provided can be tweaked by changing out threads or making Santa into a Colorado hiker or skier. Our own Gloria M. is at the head of the classroom this month offering some fresh ideas to make this class a hit with students. Your class assignment is to print off the line drawing, and color him in. Live it up, do several, making changes as you like. This will give you a great deal of familiarity with the piece before we start stitching. Also note, the little Christmas tree on the left side is not on the line drawing. It is stitched in on top of the background, slightly behind Santa. I added some beads to my tree, if I were doing this today, I would add a lot more glitz, and jazz it up more. Canvas is 10″x14″, so bring same size stretcher bars (preassembled please), and your tacks to class. You need your other stitching tools for our June meeting. You don’t need to go shopping for threads for the 1st night. Between our June meeting and July meeting, after you have your canvas, you can get the rest of your threads. Also, we will go thru the list of threads, and I will tell you “you need a yard of this for that area”. We will also talk about thread options for various areas, depending on what you like to stitch with, or what you may have in your stash. Ready? Doors open at 6:30 and the class is full, so come on time to get a good seat.